When Carmela Ciuraru asked her favorite poets to write about the poems that first inspired them, she was astonished by the illuminating responses she received. In turn, readers will be delighted by the intimate reflections on life and poetry found in First Loves.Affording close-up views of today's best poets, the book also (re)introduces readers to the timeless poems they selected. Sherman Alexie writes about recognizing the constant threat of violence on his reservation when he read Roethke's "My Papa's Waltz". It was a poem by her father that taught Virginia Hamilton Adair about the joys of poetry and the hidden life of her parent. J. D. McClatchy tells of first reading Homer by candlelight while eating a bowl of applesauce. 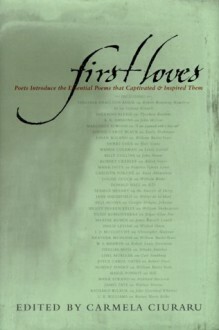 Featuring many Pulitzer Prize and National Book Award winners, the book includes essays by Seamus Heaney, Robert Pinsky, Jorie Graham, Yusef Komunyakaa, and many others.Just in time for National Poetry Month, First Loves is a testament to poetry's matchless ability to restore faith, offer salvation and solidarity, and above all, alter the course of human life.